By default distributed transactions aren’t supported in WCF services in this post is going to prove it. We will continue from the Part 1 from these series, where we created all our service layers. Next thing we have to do is host the service in IIS and test it. I assume you have read Part 1 and you follow along. In the NorthwindService project (WCF Service library) right click the App.config file, select copy and paste it again in the project. This will create a “Copy of App.config” file. Rename that new file to “Web.config”. IIS needs that file to host the service. Withing the Web.config file add a “serviceHostingEnvironment” element and delete the existing host element. Now it’s time to host the service in IIS. Open IIS manager, right click the Default Web Site and add a new application called “NorthwindService”. Set it’s physical path to the “NorthwindService” project folder. Make sure that the DefaultAppPool is selected as the application pool and it is a .NET 4.0 application pool. Right click the Nonrthwind project and select properties. Select the Build events tab and paste the following code to the Post Build event command line. This will ensure that the service hosted in IIS will be always up-to-date. Right click the Northwind project and select Rebuilt. Open your browser and enter the following url. You should see your service hosted in IIS running. Now it’s time to get serious. We are going to create an ASP.NET website which will play the role of our client. Right click the solution and add an empty ASP.NET website named “NorthwindClient” under solution’s folder. Add a new web form leaving it’s default name (Default.aspx). Paste the following code to that page and run in in your browser to see how it looks like. 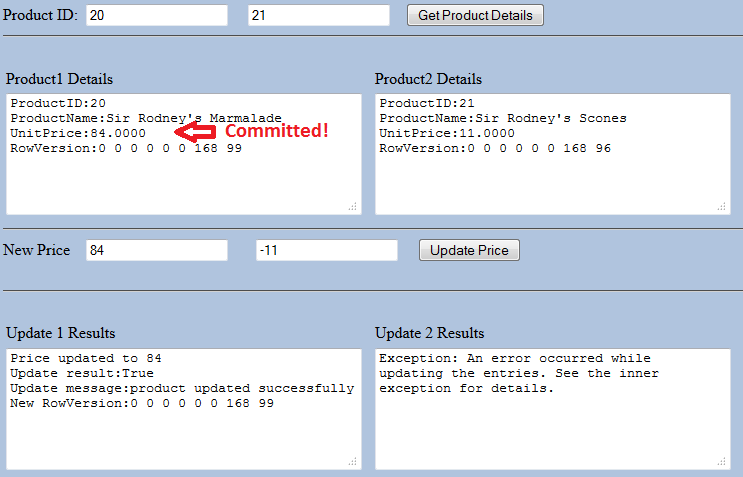 As you can see I created two textboxes to retrieve details for two products by clicking the “Get Product Details” button.. We will try to update prices of these products by clicking the “Update Price” button. On purpose the one update operation will fail. We will see that the other one succeeded by checking the price in the database. We will try the same scenario by including the two update calls in a transaction scope and see that again, the database was updated (which means transactions are NOT supported yet). Right click the website and select “Add a service reference..”. As address put the address of the service hosted in IIS and as namespace “NorthwindServiceProxy”. We need to add some code to the code behind file of Default.aspx page. Switch to Default.aspx.cs and paste the following code. 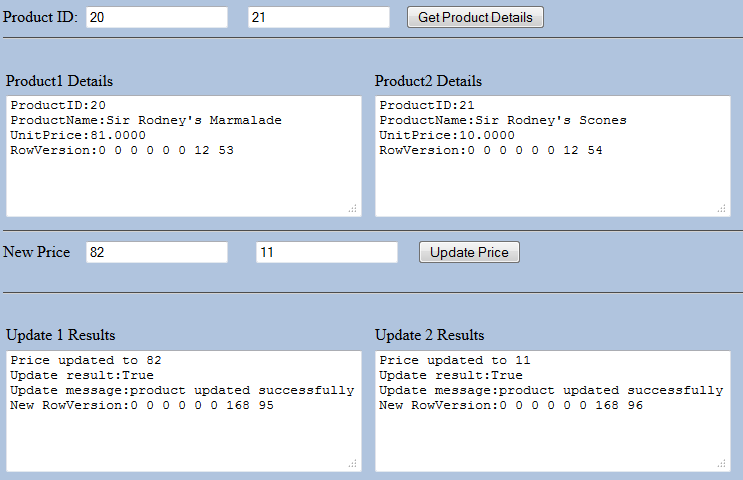 What it does is to retrieve product details for both product ids entered and maintain these products in the product1 and product2 variables. Before pasting the code, make sure you switch to Design view and double click the two buttons so the handler functions will be created and also relative code will be added to the Default.aspx page. Set the client’s website project as the Startup project and run without debugging. 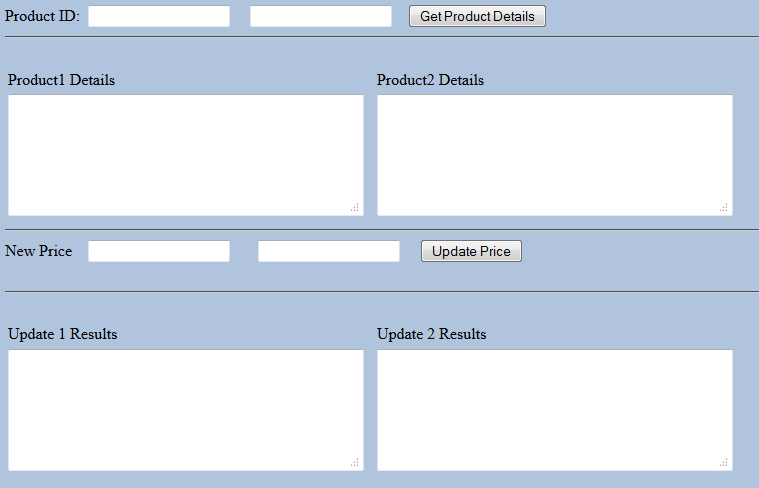 Enter two valid values for product id and click the “Get product details” button. I entered 20,21. Add the following code in the code behind file. 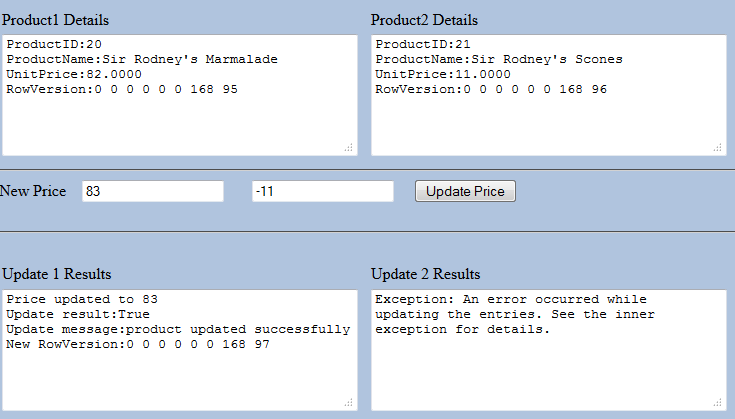 This code updates product prices for the above products retrieved. Finally it’s time to start testing the distributed transaction support. Run the website without debugging. First we will ensure that the service works normal with valid values. Enter 20 and 21 for product ids and click to retrieve the details. You can see that Unit Price for product1 = 81 and for second’s = 10. Put new price for the first product 82 and for second’s 11. Click “Update Price” button and make sure that prices are updated (you can click again “Get Product Details” button and verify). Absolute perfect till now.Now enter 83 for first product’s Unit Price and a negative value for second’s product Unit Price. Can you see what happened? The Unit Price of first product was successfully updated (you can verify it from database “Products” table) while the second update failed. This is normal though, we actually knew what’s gonna happen. Now we want to wrap both of the update calls in a Transaction Scope and see if the first update operation will roll back. Add a “System.Transactions” reference in the client project. Add a using statement for System.Transaction namespace in the code behind file. Modify the handler for the “Update Price” button to enclose update operations into a TransactionScope as follow. Run the client website again in the same way we did before. You will be disappointed seeing that still transaction isn’t supported! Despite the fact that we wrapped both the update calls into a TransactionScope, the first update call wasn’t rolled back as it should, but instead, committed to the database. The above picture shows the result after I clicked the “Update Button” to update first product’s Unit Price from 83 to 84 and second product’s from 11 to -11. Then I clicked the “Get Product Details” button again to see if the new Unit Price for the first product was committed to the database. Apparently, it did. We are almost there so hang on, in the next post we are going to see how to finally support transactions in our WCF service. I hope you enjoyed the post.